I was convinced that the existence of the Sapiens, did not go beyond 200,000. I had been led by the authority’s view of academics, entranced by the refinement of the subtles methods to travel in time of researchers, which armed with spectacular instruments like the Geomagnetism and molecular chemistry in terms of isotopes, can venture with a bit of certainty in the Paleobotany, Paleoclimatology, Paleontology and lots of Paleos more. All these tools however, are indirect, for now, since the fossilized bone is denatured, except the teeth that can last hundreds of thousands of years. It is generally considered unlikely that several species of hominids, share not a habitat, but a specific epoch, mainly because it would be impossible that some species derive from others, which has resulted to be a mere convention. Now we have the Sapiens kicking around as far back as 400,000 years, during the warm Mindel-Riss interglacial (450000-300000), if proven, of course, that the handful of teeth found by Israeli scientists last December near Tel Aviv, at Qessem cave are actually Cromagnon. In evolutionary terms is not a tragedy, but of course it dismounts the schema that the experts had established systematically at the expense of intellectual efforts and of all kinds. The truth is that the morphology of the teeth, differentiates accurately one species from another, this is a well studied stuff, so it is very likely to be as they say those responsible for the excavation, other thing, as I say, is the datation. 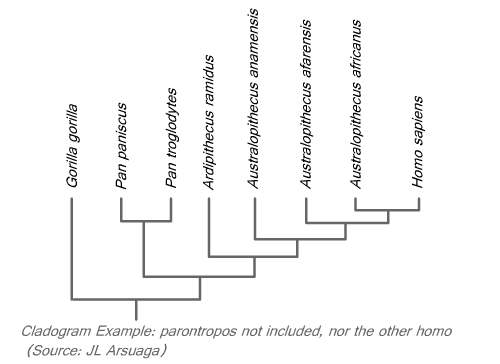 The phylogenetic tree of hominids, studded with impressive names, alleged that Neanderthals (Homo sapiens neanderthalensis) and us, descend from a common ancestor documented in Atapuerca and baptized, not long ago, with a fantastic name, the Homo antecessor, a species that softened the substantial physical differences between us and our hypothetical ancestor, Homo ergaster, another stupendous name that means “worker”. The fact is, if we had been contemporaries of Homo ergaster (“Erectus” in Asia) obviously we could not be his descendants. 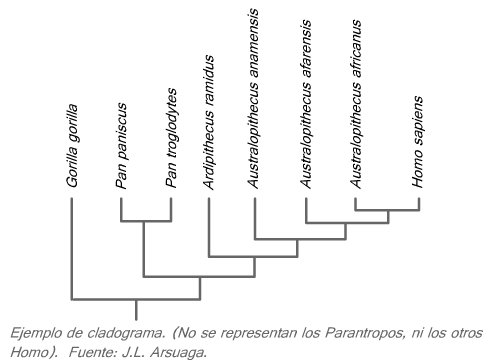 It Should perhaps be considered, the abandonment of these kind of attemps to structure the past, based on ancestor-descendant relationship, at least until more bony debris are found and new reliable methods to dating the findings too, after all there are more efficient systems, namely cladograms. Homo ergaster had facial muscles and nose too!, unlike the most ancient ancestors, so we can therefore presume a degree of expression, ok, but this hairstyle! I can’t believe it…, besides, for that matter, couldn’t they have put eyebrows?. Will exist any uproar at an academic level, but will certainly religious creationists will want to get into the fray, ready to do splinters from the fallen evolutionary tree, more in order to do harm than anything else. 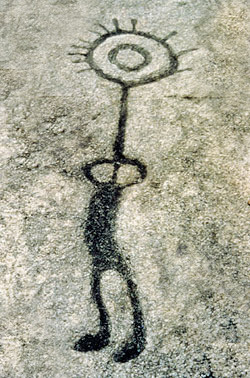 Moreover, the followers of Sitchin must be rubbing his hands. This guy, a great bookseller, holds that man was created by the gods at the 432,000, which is more closely to the dating of teeth from the cave of Magic (Hebrew: Quessem, “Magic”) , although the origin of the cipher is somewhat artificial, since flows from a cuneiform text, which curiously, more or less say that the gods made this (creating man) 120 Shar ago(1 Shar, ie one year the gods, is equivalent to 3,600 Earth years, 3,600 x 120 = 432,000 years). Although of course it must be said that the number twelve, seven or sixty are “round” numbers with which the ancients represented the idea of complete, totality, even today it is said over here (to thousands of miles of Mesopotamia): “… to me entered the seven things …”, to express “I could not be more sick” or “I got so sick”, in such a way that the accuracy of these kinds of figures is more than suspicious. In any case, at the expense of the image of anthropology, anthropologists are usually reasonable people, although the uninitiated, we should stop abide by judgments of authority of any kind, be more critical and never take anything for granted at all. Bibliograph. : Juan Luis Arsuaga “El collar de Neandertal”.